ObsVis is a tool to aid in observation planning which allows the inspection of sky images with overlaid instrument fields-of-view (FoV). ObsVis interfaces with the SAOimage DS9 image display tool, and facilitates detailed manipulation of Chandra pointing and instrument parameters. ObsVis is available as part of the CIAO software or as a standalone software package. If you are interested only in interactive plotting of Chandra's roll, pitch, and visibility for a selected target, use the PRoVis webpage. The Chandra aimpoint has changed throughout the mission primarily due to thermal changes in the Aspect Camera Assembly (ACA). To compensate for these changes, default offsets were introduced to place the target away from chip edges or node boundaries and closer to the optical axis. In the past year, ACA temperatures have fluctuated more rapidly. To compensate for these changes, optimal target offsets will be calculated and applied at the time a target is scheduled to be observed. Therefore the default offsets in ObsVis have all been reset to 0 as of cycle 18. Of course users can still specify custom offsets which will be taken into account at the time of scheduling. Full details are given in the POG, Chapters 4 and 5. In ObsVis default offsets are stored in a calibration file (obsvis.cal) copied to the home directory when ObsVis is launched. If a new version of obsvis.cal is available, an option to download the new version is given at launch. This overwrites the existing ~/.obsvis.cal. Here we provide a basic example of using ObsVis. For more detailed information, refer to the help file. Let's assume that you want to observe NGC4051 with Chandra. It's a good idea to see when it is visible by Chandra before choosing an appropriate roll angle for your visualization of the field of view. Go to the CXC PRoVis webpage. To use the cataloged coordinates, type "NGC4051" (without quotes) in the Target Name box and click the Resolve Name button. 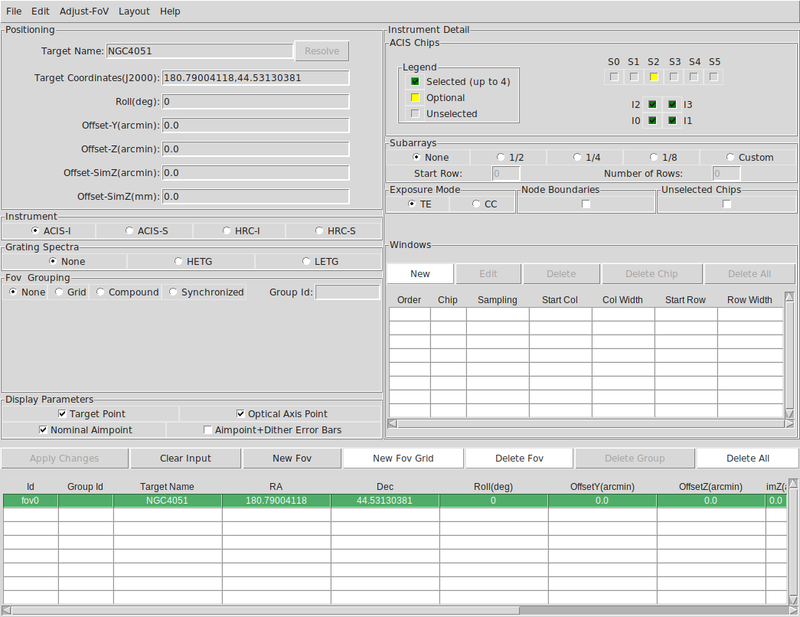 After the coordinates appear in the Target Coordinates box, click the Generate Plot button. The resulting plot shows the Chandra roll/pitch/visibility of NGC4051. Since it is best to avoid time-constrained observations, a good roll angle for NGC4051 is for example 120 degrees. Once you have downloaded and installed ObsVis, start it up by typing obsvis. The ObsVis GUI will open, along with SAOImage DS9. Let's assume that your primary interest is to image NGC4051 with ACIS-S3, but S2, I2, and I3 will also be turned on for archival use. On the ObsVis GUI, click on ACIS-S under Instrument. In the ACIS Chips instrument detail, uncheck S1, and S4; select I2 and I3. 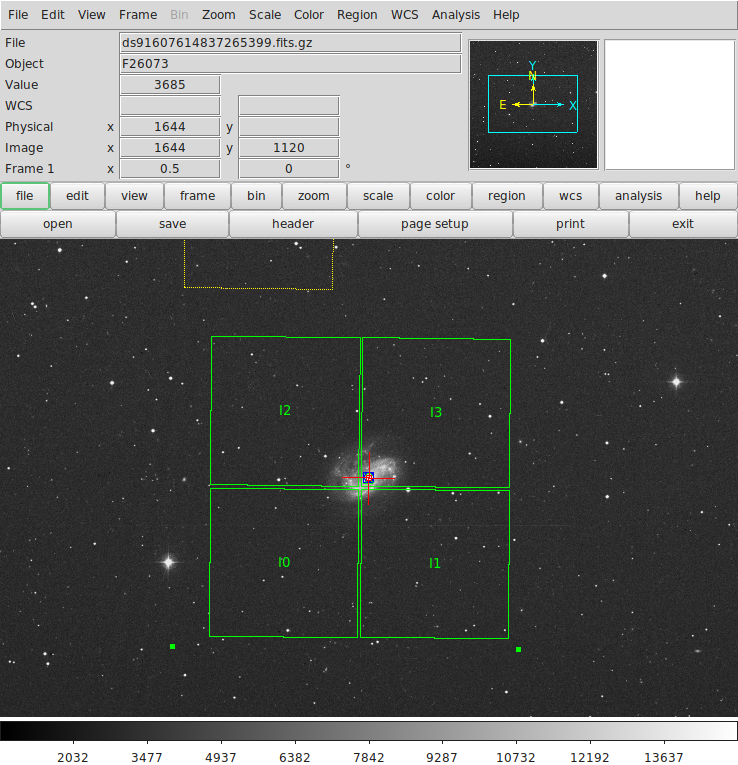 Type "120" in the Roll box and "NGC4051" in the Target Name box, then click "Resolve". Click the New FoV button. A new Field of View (FoV) labeled "fov0" (the default) will appear in the table at the bottom of the GUI. After requesting a new FoV, an SAO-DSS Server box will open with the object coordinates and the DSS image will be retrieved and displayed in DS9. The NGC4051 catalog coordinates are at the aimpoint. The red marker displays the size of the default Chandra dither pattern. The DS9 display may be adjusted via ObsVis to create a nice proposal image. Open the "Preferences" dialog from the "Edit" menu in the OBSVIS GUI. To remove the CCD chips labels, for instance, you can select the "FoV Defaults" tab and uncheck "Display Chips Labels". The DS9 display is updated when "Ok" is clicked. In the following DS9 display, the image zoom is set to "zoom 1/2" and the color is set to "Gray". The DS9 "File → Print" menu can be used to save the image in several file formats. We recommend printing to a Level 1 postscript file for best results with latex and PDF generation.